In this semi-autobiographical guidebook-to-life, Amber Rae uses a combination of short stories, self-help tips, and prompted journal pages to help her readers push past their fears and realize the amazing things they are capable of. With chapters on self-doubt, procrastination, envy, imposter syndrome, perfectionism, and a whole host of other relevant topics, each short chapter includes a topical anecdote from the author’s life, helpful tips, and a page for journaling, mapping, or doodling. One chapter in particular that I loved was the chapter on anxiety (whew . . . is it getting vulnerable in here or is it just me?). In this chapter, Amber Rae discusses the role anxiety has played in her life and walks through different possible tactics to truly conquer anxiety, rather than try to simply make it go away. For example, she suggests writing down anxieties as a way to “create a release” or using anxiety as creative fuel to “channel the energy into creating something useful.” The chapter ends with a journal prompt, asking the reader to reevaluate what their anxiety is trying to tell them. 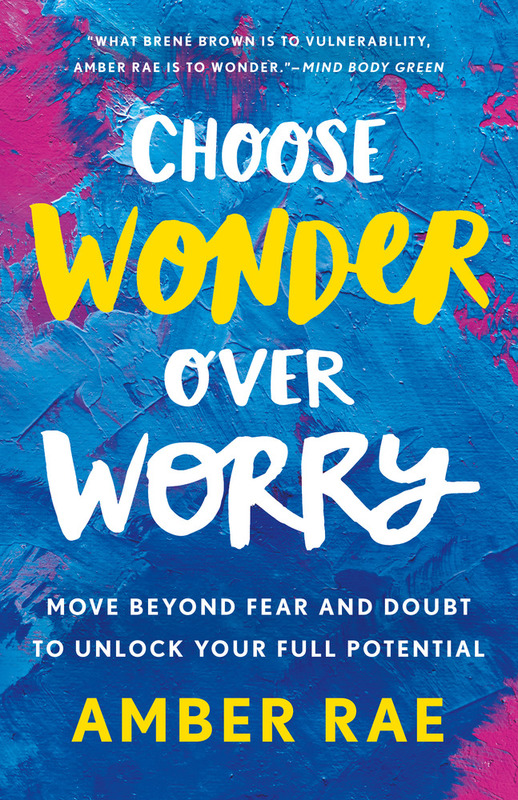 Perfect for fans of Elizabeth Gilbert and Brené Brown (or perhaps the younger siblings of those fans), CHOOSE WONDER OVER WORRY is a valuable tool for older teens and new adults who are just trying their hardest to figure out how to navigate life on their own for the first time (and the many confusing emotions that accompany it). AND . . . if any of you are heading to Philly next week for PLA, be sure to check out the “Best in Debut Authors” panel, featuring Amber Rae and four other new authors! And stop by our booth (#1607) to say hi!